Humans can only last a few days without water. As such, it is arguably the most important item in your backpack. In this article, we’ll discuss several methods for water purification and help you decide which option is the best for you. “All About:” is a series of extensive backpacking articles written exclusively for Wild Backpacker by our guest writer, Ryan Gardner. See About the Author section below. More and more researchers are finding that backcountry water isn’t as “dirty” as we once thought. Pristine streams at high elevations, areas free from animal grazing, and areas with low human traffic are likely safer than many of us think. Springs coming straight out of the mountain taste great, and I almost never bother purifying in these situations. However, in most cases, I prefer to take a “better safe than sorry” approach. Besides boiling, which takes up too much time and fuel, water purification methods fall into two main categories: filtering and chemical treatment. 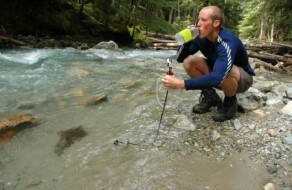 Water filters act by physically removing the harmful contents found in backcountry water. 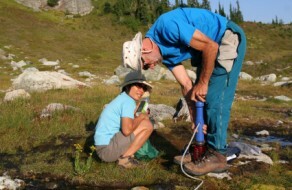 Water filters ideal for backpacking typically have a “pore” size of 0.2 – 0.3 microns. This means that anything smaller than 0.2 or 0.3 microns will slip through the filter and end up in your drinking water. A pore size of 0.2 – 0.3 is small enough to remove protozoa like Cryptosporidium and Giardia. It is also small enough to remove bacteria like E. coli and Salmonella. Viruses, however, are typically smaller than 0.1 micron, and will not be removed by your average backpacking water filter. This inability to filter out viruses will probably not be an issue if you are backpacking in the United States. If you plan to travel to far-away exotic countries to hike, be sure to find out any possible viruses common in that region, and make sure you are up to date on your immunizations. Water filters have a specification called “capacity” or “cartridge life.” This means that the water filter will be effective for “x” number of liters, at which point the filter element needs to be replaced. Small, lightweight water filters from companies like Katadyn and MSR have a capacity of 750 – 1000 liters. Instead of using physical methods to remove the “bad guys,” chemical treatment methods actually kill the bugs. The traditional chemical treatment is iodine. Iodine effectively kills protozoa, bacteria, and viruses in 30 minutes. Unfortunately, it gives the water an unpleasant taste and makes your water bottles smell for quite some time. Vitamin C, or ascorbic acid, can be added to the water after the 30-minute waiting period to neutralize some of this unpleasant taste. Potable Aqua makes iodine tablets, as well as “PA Plus,” an ascorbic acid tablet to remove the foul taste. Chlorine dioxide has become a popular alternative to iodine. This is the same chemical used for treating municipal drinking water. Chlorine dioxide kills viruses, bacteria, and Giardia in 30 minutes, but it is recommended that you wait up to 4 hours to kill Cryptosporidium. Maybe I’m playing Russian roulette, but I routinely use chlorine dioxide Micropur tablets and have never waited the full 4 hours. The only time I have been overly cautious was when hiking in a rain forest where the guidebook specifically mentioned Cryptosporidium as a possible threat. Chlorine dioxide also leaves an unpleasant taste in the water, but I find it nowhere near as bad as iodine. On a long, hot day, it might go unnoticed. While ascorbic acid won’t neutralize the taste like it does with iodine, my wife and I have found the perfect solution for chlorine dioxide. We buy the little Crystal Light “On The Go” packets from the grocery store, and pack one for every liter we think we will use on the trip. We fill up a 1-liter bottle at the stream, drop the chlorine dioxide tablet in, and immediately pour in one packet of Crystal Light (no need to wait). Any unpleasant taste is completely masked, and now you have a great tasting drink to enjoy all day. Aquamira and Katadyn (Micropur) make great chlorine dioxide tablets. Avoid the liquid Aquamira product that requires “Part A” to be mixed with “Part B,” as this can be a headache to do in the field. Using chemical treatment requires you to wait at least 30 minutes before drinking. As long as you do things right, you shouldn’t ever be thirsty and unable to drink. I typically drink from one bottle as I hike, and leave the other alone. When it is time to fill up at a stream, I fill up the empty bottle, drop my tablet in, and hit the trail again. At that point I start drinking from the other bottle, and the one I just filled up can take its time to purify. There are consumer products now available that use ultraviolet light to purify your drinking water, the most popular of which is the brand SteriPEN. This product kills protozoa, bacteria, and viruses, and leaves no unpleasant after-taste. One liter of water can be purified and ready to drink in 90 seconds. 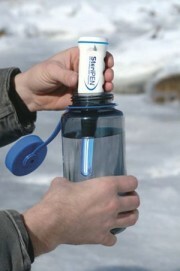 A SteriPEN can be purchased for about the same price as a water filter. Keep in mind that these products require AA or CR123 batteries to function. Having your batteries run dry could cause for an uneasy trip, and because of this, I personally prefer to steer clear of these. So Which One is Best? Water filters weigh anywhere from 11 – 16 ounces, and can be quite bulky. Micropur tablets for a week weigh less than 1 ounce, and take up almost no space at all. In addition, the process of setting up your filter and pumping a liter of water takes a decent amount of time. With tablets, you fill up, drop the tablet in, and hit the trail again. A SteriPEN is fairly quick as well, but takes up more weight and bulk and is dependent upon batteries and electronics. Batteries and electronics aren’t something I want to be reliant upon for something as crucial as water. In my opinion, chlorine dioxide tablets win by a mile. Try out some different options and see what works best for you! Note: Wild Backpacker is not responsible for any possible errors in this article. Always follow the instructions provided with any water purification system. Don’t rely on something in the field that you are not familiar or comfortable with. In other words, don’t be stupid, and use this advice at your own risk. Wild Backpacker is honored to have Ryan Gardner as a guest author and exclusive writer. As an avid backpacker throughout the mid-west and western United States, he has accumulated a wealth of knowledge about backpacking and nutrition. Ryan earned a B.S. in Exercise and Sports Science from the University of Utah and is currently pursuing a Doctor of Dental Surgery degree from Creighton University. Have a 5-star backpacking recipe for a tasty breakfast? What about some expert advise on outdoor first aid? Wild Backpacker would love to share it! Submit your backpacking recipe or contact us with your idea of what backpacking-specific content you could contribute to the Wild Backpacker community.